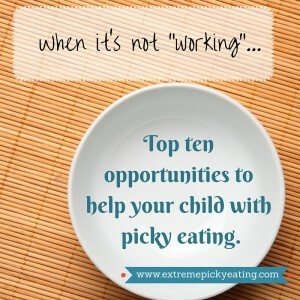 Helping your child with picky eating, extreme or not, is a marathon, not a sprint… When we work with clients, or hear from parents at workshops or parents who’ve read our book, the STEPS “click” right away for some: their children are less anxious, enjoying meals, and tuning in to appetite and curiosity about new foods. But occasionally we hear, “It’s not working!” Sound familiar? Then this post is for you. 1: You and your partner aren’t on the same page. Result: There is no consistent approach, which is confusing for Timmy, and this increases his anxiety! (STEP 1 and 3 above are missing.) There is still pressure and power struggles, anxiety, and unpleasant family meals. Timmy’s appetite and curiosity around new foods is sabotaged. Try: Talk with your feeding partner/s about where you differ in your opinions and approach about how foods should be served and meals managed. What were your childhood mealtimes like? Do you have different expectations about behavior? Food served? Quantity eaten? Can you agree that what you’ve tried so far isn’t helping? Maybe things are even getting worse? Can you agree to let one parent “drive the bus” for a time, say six months and look for progress? This can be such a tricky situation that we wrote a whole guest post about it! 2: Child eats well at snack times, but not meals. This often results when parents have “snack” foods which tend to be easier to enjoy, like cereal bars and crackers, while the more challenging foods show up at meals. Snacks may also be more “fun” or relaxed, served in front of screens or at a special kids’ table without pressure– unlike meals. Try: Look at snacks and meals as more neutral “eating opportunities” and try to serve foods that may be included at dinner for snack, and vice-versa. Also keep track for a few days and see if you are able to offer regular opportunities about every 2-4 hours so your child isn’t starving, but has an opportunity to develop an appetite. Sometimes if a child knows he can have his preferred snack food right after dinner, why bother? Remember not to pressure. 3: You aren’t “all in”. We heard from a dad who said, “I’m doing everything you say to do and it’s still not working.” After a brief discussion, turns out he thought that drinking milk was so important that there were still battles at every meal over that cup of milk. Result: Continued pressure, power struggles and anxiety. Try: What you are worried about. Calcium? Protein? Do you need to worry? Is your approach helping? Back off the pressure about the milk and see if meals improve. Look for other ways to offer calcium if that’s why you worry. We’ve had many families tell us that their child started asking for milk again after a time, and once they were certain that they wouldn’t be pressured. 4: Missing signs of progress/expecting too much too soon. Early progress will likely not be suddenly eating more or new foods (but it might be, we’ve had kiddos who have “never been hungry” ask for more food within days of implementing STEPS+). Other parents thrill at the decreased anxiety, the child who does eat more and even tries a few new foods– but it’s not fast enough! “She’ll never try a new food unless I make her” leads to pressuring or encouraging bites and forgetting that the child who basically hated food for the first three years or her life has made massive strides in the last handful of months. Result: Wavering faith in the process and temptation to fall back into pressure. 5: “Offering” but not providing a true variety and still stuck where the child mostly gets served the same handful of accepted foods. Result: Child continues to eat only safe foods and doesn’t branch out. Try: Use bridges to link safe foods to other foods. Keep notes about your child’s preferences (and new preferences) and be on the lookout for recipes and new food items that might be accepted. Or allow your child to help you in the kitchen, or hit the samples at Costco during snack time. You might be surprised at the interest in a food that isn’t in front of them on the kitchen table. No expectations, no pressure! “Jack will help me scoop foods off the cutting board into a bowl. He might lick his fingers, and now and then I see him take a taste of something we are making. I have to look away so he doesn’t see me get excited. As soon as he senses that I want him to eat something, forget it!” Really offering means serving a variety at the family table, not standing in front of the fridge and asking what your child wants. Cereal? French toast? Bananas? A muffin? The choices may overwhelm and the first answer will probably be “no!”. 6: Missing an oral-motor, sensory, or medical problem. So you’ve tried it all, and even seen a doctor or therapist who says nothing is wrong with the way your child eats. Sometimes the therapist isn’t experienced in feeding problems or the doctor doesn’t “believe” in tongue ties. Result: Child continues to struggle with acceptance of a variety of textures, spits out food, swallows food whole, gags/vomits, etc. He feels out of control and uncomfortable with eating, so he protects himself by not doing much of it. He may seem interested in eating, but unable. Try: Get an evaluation by an experienced therapist (SLP or OT) who has worked with many children with feeding problems. Ask them for a referral to a doctor if you need one (tongue-tie, reflux, constipation, other unknown medical issue)- they might know more about the doctors in your area. 7: Continuing to pre-plate your child’s foods. Result: Child still feels pressure! Think about it. 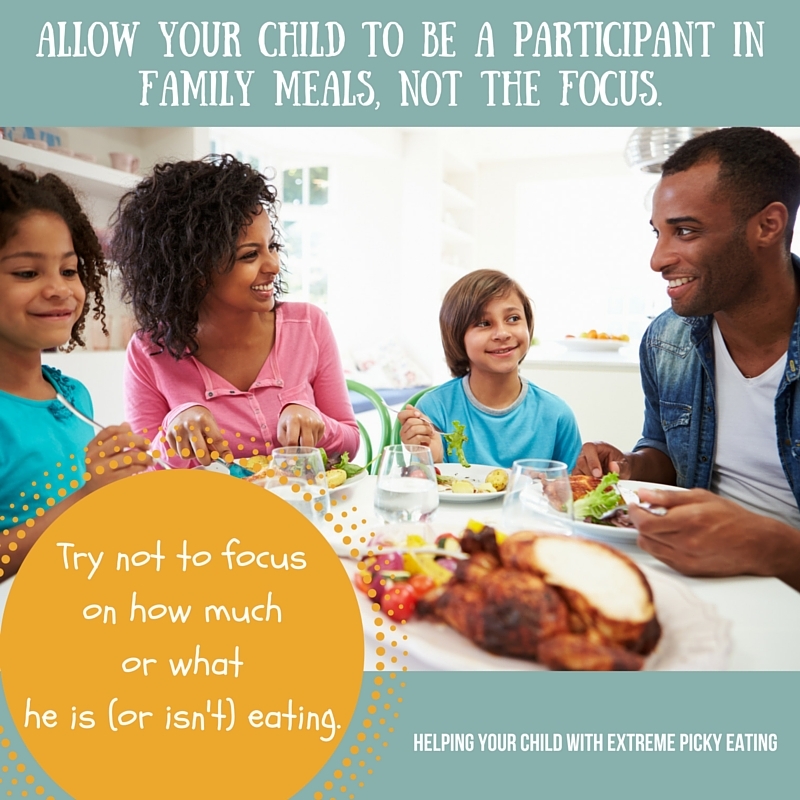 When children come to the table and see a plate of food in front of them, before they even sit down, you hear, “You know I don’t like that!” How much of that do I have to eat!” “It’s touching!” Your child is negotiating– unsure and anxious from the start– and this will decrease his appetite. 8: Continued grazing or lack of routine = appetite sabbotage. You try to get your child to eat less at snack times so she is hungry for meals. Lisa gets home at 4:30, hungry but parents want Lisa to eat at dinner when more balanced (and challenging!) offerings are on hand. Lisa gets a bowl of crackers while Mom and Dad race to get dinner together. Result: Child continues to eat little at meals/snacks and you are concerned about intake. (See #2) Offering milk on car rides, continually giving snacks at the store, or allowing your child to grab food from the pantry throughout the day sets him up for limited appetite during structured eating opportunities. Try: Offer planned, sit-down eating opportunities every 2-4 hours (more often for younger children, spaced out for older children.) Offer only water in between. At first your child might not like not being able to snack when she wants. Try, “We’ll eat again soon, right now we are going to play Legos.” A visual chart can help some children understand the routine. Organize the day so that boredom doesn’t lead to mindless food-seeking. Maybe have gross-motor play time right before meals- swinging or trampoline time might help kids with self-regulation, and be ready to sit and tune in to hunger and appetite cues at eating time. 9: Family meals are too much work or stress, you can’t think of anything that everyone might like… so kids are still eating their foods separately from parents. Result: Kids are missing out on the most important thing at the table– you! Enjoying pleasant family meals allows them to see the foods they will learn to like to eat, with the people they love and trust most in the world. 10: Too much nutrition talk. In our era of “sugar is poison”, “clean eating”, the ubiquitous green smoothie, and protein preoccupation, parents are told they need to educate their children about nutrition. The thinking goes that they will make better choices if they just realized that vitamins and vegetables were good for them! Honestly, one study showed that the French have less “nutrition” knowledge than we do, but in general have a much healthier relationship with food and their bodies than most Americans. Knowing is not half the battle in this case, and may make the battles harder. Ask yourself if you frequently try to use nutrition talk to motivate your child. Has it worked? Result: Lecturing children about nutrition likely will go over their heads. Young children can’t grasp complex nutritional messages and may get confused. Particularly harmful to children, especially those with anxious, perfectionist, or OCD traits and struggles, is messaging that vilifies foods. Scaring children about salt, fat or sugar is likely to make them more anxious and food avoidant and may trigger an eating disorder. Try: Sure, good nutrition is a goal, but try looking at it as a long-term, rather than short-term goal. Trying for best may make it worse now, and in the long run. Try neutral descriptors around all foods. A food may be “packaged” or “fast” rather than “crap” or “junk”, or just a burger. Avoid words like “toxic” or “poison” unless a food is spoiled, there are allergy or reaction concerns- even then you might choose other language. Helping children feel safe and confident, and giving permission to enjoy the foods they enjoy now will help them branch out- more than a lecture will. We hope this list has given you some ideas if you are working on feeding your children and enjoying family meals. 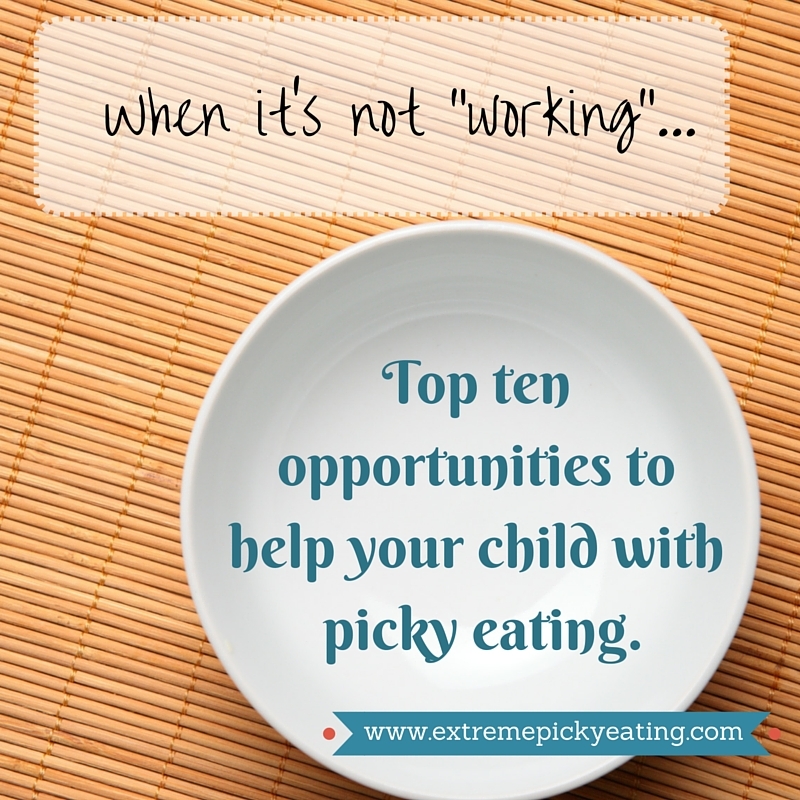 We share lots more specific tips and scripts in our book, Helping Your Child with Extreme Picky Eating. Hang in there! All advice is general, and not intended to replace care by a medical team. Particularly if there are nutrition deficits or growth is slowing or your child is losing weight, careful evaluation and treatment is a must.